The National Save the Sea Turtle Foundation (NSTSTF) is lending support to the joint research efforts of Mote Marine Laboratory and the Conservancy of Southwest Florida to better understand the Kemp’s ridley aggregations in the eastern Gulf of Mexico. 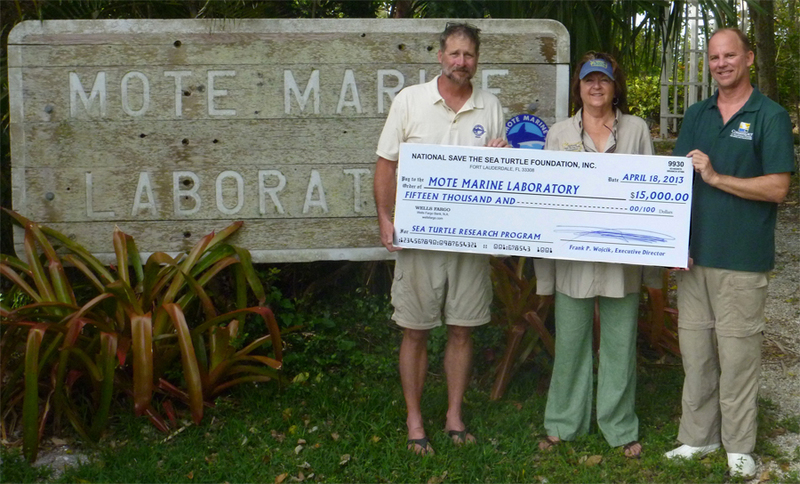 Ms. Helena Schaff of the National Save the Sea Turtle Foundation visited the Mote Field Station at Demere Key to present a check for $15,000 that provided essential support after a combination of red tides, cold fronts and Hurricane Sandy weather interrupted several field trips in fall 2012. The partnership between Mote Marine Laboratory (MML) and the Conservancy of Southwest Florida (CSF) is the only dedicated study of Kemp’s ridley ecology currently underway in Florida. Field work is conducted under approved state and federal permits, and field logistics are based from Mote’s Demere Key field station on Pine Island Sound. The support allowed researchers to float the boat to conduct in-water captures with large-mesh tangle nets. The turtles that are captured, sampled, marked, and released provide basic information about the Kemp’s ridley, considered the most endangered of sea turtles but also reasonably abundant in eastern Gulf coast waters. The monitoring of subadults and adults allows the management and conservation of a rapidly recovering species that was rescued from perilously low numbers as recently as the mid 1980s. The NSTSTF’s funded and supported trips provide essential field work that can be applied directly (through related studies of stale isotopes, satellite telemetry, health assessments, genetics, dietary study, and home range analysis) from data or samples taken during field operations. Field trips are also essential to evaluate how turtle aggregations are responding to in-water hazards like red tides and boat traffic. MML, and CSF are 501(c)(3) non-profit organizations with established roles as leaders in marine science in the Gulf of Mexico. Visit www.seaturtle.org/tracking/?prpject_id=569 to learn more or see a related article about the project that’s featured in National Save the Sea Turtle Foundation’s Florida Environmental Outreach Magazine (Vol. 3 Issue 4). Left to right: Tony Tucker (Mote Marine Laboratory), Helena Schaff (National Save The Sea Turtle Foundation), and Jeff Schmid (Conservancy of Southwest Florida).